A little Carob love for our wheat sensitive doggys. 2. Mix all ingredients in a large bowl and knead until dough is formed and smooth, you may need to add a little more water as the dough tends to be on the dry side. 3. Roll roll onto a heavily floured surface 1/4 inch thick and cut with small cookie cutter of your choice. Place on prepared baking sheet. 4. Bake for 10 to 15 minutes or the cookies start to crackle. Make sure you knead the dough very well, it may take some work to get the dough to come together. 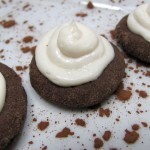 I didn’t mind the white flour on the finished cookies but if you do dust your work surface with carob powder instead. Thanks so much for the recipe. I added two teaspoons of peanut butter to make it a bit more brownie-like. My Ridgebacks love it. 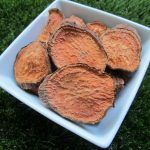 Would you mind if I put a link to your recipe on my blog? Peanut butter is a great idea, I’m sure they loved it. Feel free to link away, I’m happy you want to share. Woof! Can these be frozen? How are they best stored? They can be frozen for 4 to 5 months and freezing them is the best way to store them. Woof! I make a lot of dog biscuits and usually cook for 30 minutes then dehydrate until moisture is gone. I find that this helps preserve them for a longer time. Anyone else dehydrate to help preserving without refridgerating? My two pups love these cookies! I have made them several times now. I freeze them and they come out great. That’s fantastic! I’m glad you found a recipe that your pups adore. Woof! My dogs went crazy for these!! Thanks for sharing! I did have to add 1/2 cup more of rice flour to get a good consistency. Hi, are these good for dos? Are they healthy? Thanks! 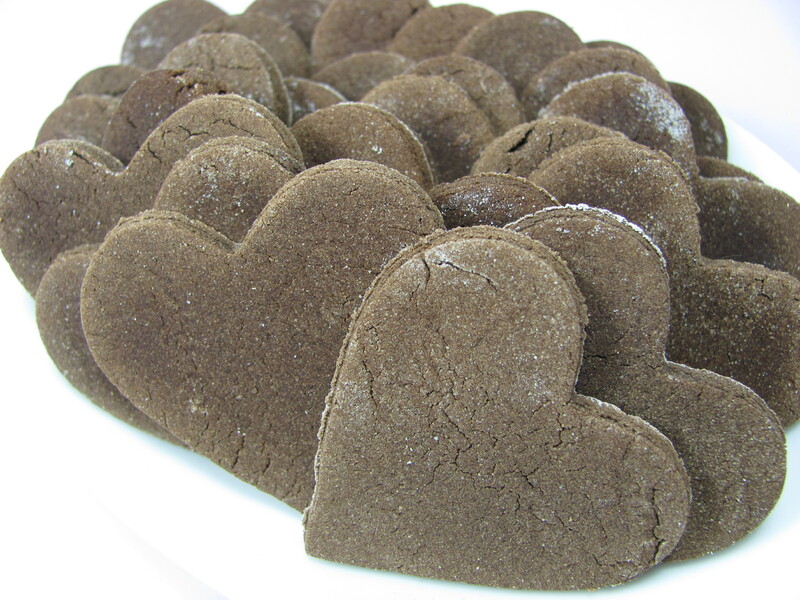 I recently made sorghum dog biscuits, but this carob recipe looks great! I know dogs should not have chocolate, but carob is fine, and my dog loves it. Thanks for this great and easy recipe! I’m having trouble finding rice flour locally. I really would like to make these treats now. Can wheat flour be substituted for the rice flour? Thank you for your help. Just wanted to let you know that I have been making these for about a year. It is an awesome recipe! My pups love them. I make at least two recipes at a time and I freeze them. I’m so glad you and your pups like it so much Julie! Thank you so much. Woof! 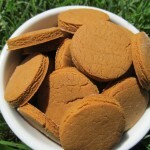 My understanding is that most of the alcohol is baked out of any treat (http://lagrima.com/blogs/news/10179737-is-there-alcohol-left-after-i-bake-with-vanilla-extract) but if you don’t feel comfortable feeding it to your dogs feel free to leave it out. Woof! There fun and easy to make! I Mite Make More! Thank you TheCookingFox, I’m happy you liked them! I use a alcohol free vanilla. 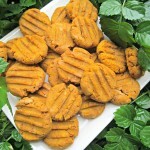 These cookies look great and simple to make. Haven’t tried them yet, but I’m so excited. These I can make and freeze. Before I leave for work I take an old sweatshirt and hid a small pieces of treat or 2 in the sleeves, pouch wherever. Then I roll it up tight, get Harley, my min pin really excited and give it a toss. Gives him something to do for the first 10 minutes trying to get the shirt unrolled, the sleeves pulled out, etc., so he can retrieve goodies.